When heating with electrodes it is imperative to achieve the best possible temperature and the desired convection, in order to guarantee glass of good homogeneity. Werner Bock highlights the benefits of all-electric melting and how efficiency can be increased with a boosting system. Bock Energietechnik, based in Germany, builds all-electric melting furnaces for glass production. The company develops and manufactures electrical heating systems as complete units, in addition to individual components for glass melting and processing furnaces. Heating with electrodes involves different principles to heating with flame combustion of fossil fuels. Therefore, it is necessary for the furnace engineer and the electrical engineer to work closely together, right from the outset of the furnace design. The layout for the heating with electrodes is dependent on many factors. Therefore it is necessary to become thoroughly familiar with the melter complex. This begins with glass composition, batch materials and their quality, glass colour, the existing method of heating the tank, melter output, the desired glass quality and the system as a whole. The question is, what advantage is to be achieved with a boosting installation? Is it to increase production, improve quality, or both? The arrangement of the electrodes and the power distribution in the melt are dependent on the answer. After the glass parameters and melter dimensions have been obtained, the electrical heating is examined using model experiments. Two types are available: Physical modelling and mathematical modelling using computer models. The mathematical method, which can be completed more rapidly, is simpler and less costly, while physical modelling gives a more realistic, animated and notable representation. For these reasons, both methods are often applied in combination. At the end of the testing process, both modelling results are compared and combined with the experiences. From these three pillars, a reliable foundation for a wellfunctioning boosting installation can be obatined. If an increase in production is the primary impetus for the installation of a boosting system, then it is sufficient to optimise the energy in the melt region. It is important to consider that the characteristic temperature and flow profile developed by conventional heating should not be disturbed, but enhanced. This is most frequently achieved with side electrodes, if the melter width permits it. If, however, an improvement in quality is the goal, then it is sensible to work with bottom electrodes in the area of the hot spot. Glass flows, which are a given as a result of flame heating, also exist here and can be supported positively by the boosting system. In this manner, the melt is also stabilsed. In both cases, the reduction of waste gas emissions, particularly the carbon footprint, is an additional bonus. It cannot always be determined exactly whether bottom or side electrodes should be used. Often, it is prudent to combine the use of both bottom and side electrodes. Once again, this is dependent on the melter size and on the melting characteristics of the glasses. It usually depends on defining a sufficient number of electrodes and their optimum positioning in the melt zone. Also, care must be taken to have a balanced ratio between electrode potential and current load at a corresponding electrical power. In this context, top-electrodes have proven to be quite successful in all-electric melters (cold-top melting). These have the advantage of not coming into contact with the bottom or the sidewall and therefore do not cause typical signs of erosion. They can be optimally placed and easily relocated if needed. Several advantages can result from this application. In addition to precise planning and reliable equipment, controls and facilities are also necessary for a well-functioning boosting system. These should be designed so that they last for the several furnace campaigns and can meet additional demands during the current furnace campaign. This process begins with the design of the electrode holder. It is important here to not only provide for good cooling of the electrode, but also to consider low refractory erosion. If the construction of the holder, the cooling and the installation method are in accordance, a long operating times is possible. A cable connection, consisting of many parallel installed cables. A bus bar connection - this can be constructed in different materials, such as aluminum or copper, as well as various types of protective systems. 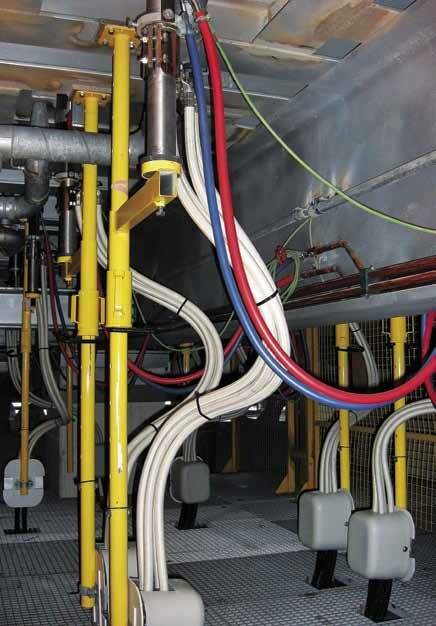 An optimally installed cable connection, based on experience at several furnace locations, is usually the least expensive and safest type of connection. Transformer with secondary tap change and high-tension connection to the primary side - continuously variable control with additional equipment. Adjustable transformer, designed for direct high tension supply - continuously adjustable control through a secondary voltage tap. Thyristor with transformer - the thyristor serves as the control unit in front of a transformer connected to the electrodes. In addition, a power transformer is naturally required, which is located in front of the thyristor. At all times, it must be considered in what manner the operational requirements are best served. Power-dependent control - power to the electrodes is determined by the control system. Current-dependent control - current to the electrodes is determined by the control system. Voltage-dependent control - the voltages at the electrodes is determined by the control system. Current control is frequently used because indirect temperature control is also achieved. Therefore, when the temperature decreases, the resistance increases. In turn, the supplied current is increased. Control and documentation of system data is usually accomplished with digital process control systems, which are fed by analogue measurement devices. All operating data is accumulated here, presented on visual display units, and archived. The data includes electrode current, electrode voltage, temperature of the electrode holder, power and usage. In terms of safety devices, it is advisable to install a ground electrode. This ensures zero potential in post processing. In addition, each individual electrode must be measured at the connection to the steel mounting. Naturally, appropriate electrical isolation must be installed for conductive parts, such as electrodes, transfer connections and transformers.